From 25 August to 22 September 2018 in Djibouti, the Technical Section of the French Army (STAT), the Directorate General of Armament (DGA) and prime contractor MBDA conducted an evaluation campaign of the Missile Moyenne Portée (Medium-Range Missile, or MMP). The purpose of this evaluation was to verify the MMP’s suitability for use in a semi-desert environment. For this purpose, nine missiles were fired, and all reached their targets. The results confirm the reliability of the weapon system in a hot environment as well as its performance during operational firing scenarios. 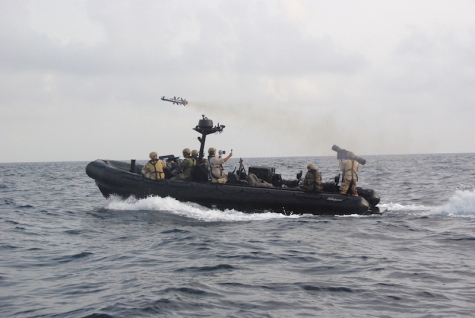 Two missiles were fired by Navy marine commandos from the multi-purpose commando boat (Rigid-hulled inflatable boat, known as ÉCUME): the first was fired from the sea against a target on land, and the second from the boat against a target on the sea. MMP is the first weapon system of this type that can be operated from an ECUME. The French Forces in Djibouti (FFDj) have a training environment and weather conditions approaching those found in the current operational theaters in the Sahel-SubSaharan belt. The firing results of this trials campaign in a hot environment will allow the deployment of the MMP to Operation Barkhane, in Western Africa, in the coming weeks. The 1,450 soldiers of the French forces in Djibouti (FFDj) are stationed in Djibouti in accordance with the defense cooperation treaty that France signed in 2011 with that country. The advanced operational base (BOA) where they are base provides French forces, as does the BOA in the Ivory Coast, various capabilities: as a reservoir of forces, it participates in the defense of the French interests, the logistical support of the operations on the continent, while contributing to military actions for the benefit of several African countries. In addition, French forces stationed in Djibouti are supporting their partners in the East African Regional Economic Community to strengthen their military capabilities, including through their participation in peacekeeping operations.